The Isle of Skye is well known for its dramatic and spectacular landscapes. It is a haven for walkers, climbers, photographers and wildlife enthusiasts alike. It is also becoming the home for many new, exciting and unusual activities for tourists and locals. With the growing popularity of Gin, the producers of Misty Isle Gin have set up a Gin School in the heart of Portree. Here you can create your own Gin and design your own label – a very special treat to take home with you. In Uig, to the north of Skye, not only do Isle of Skye Chocolates make and sell fine Hand Made chocolates and drinking chocolate, they also run 4-5 hour courses in Chocolate Truffle making – what better way to spend an afternoon. 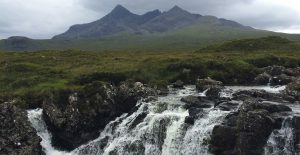 Based in Broadford, Skye Jeep Tours allow your to create your own itinerary and can take you to all of those out of the way locations to marvel at the beauty of Skye. Their tours last no less than 7 hours, so plenty of time to explore what Skye has to offer. If its something more relaxing that you are looking for, then look no further than Seaflower Skye. Based in Portree, they offer full and half day boat trips to the Isles Rona and Raasay. The trips also include beautiful, locally caught seafood and a little glass of something sparkling. For an unbeatable view of Skye why not take a trip with SkyeFlight. They have a beautiful little Bulldog light aircraft, that Lisa just loves, with flights taking off from Broadford Airstrip – a truly magical experience. If you prefer to keep your feet firmly on the ground, then why not join Skye High Wildlife Photographer, Stewart Dawber, on one of his Wildlife and Photography tours. If hitting targets is your thing, then ACE Targets near Portree is for you. Experience Archery, Axe Throwing, Air Rifle Shooting and Clay Target Shooting. Guests have been here and loved it.